Richard J. Bauckham, FBA, FRSE (born 22 September 1946) is an English scholar in theology, historical theology and New Testament studies, specialising in New Testament Christology and the Gospel of John. He is a senior scholar at Ridley Hall, Cambridge. — Wikipedia (4th Oct 2015). 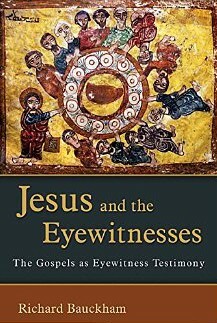 Richard Bauckham is probably best known to the wider public for his book Jesus and the Eyewitnesses: The Gospels as Eyewitness Testimony in which he argues that the gospel narratives about Jesus were derived from reports of eyewitnesses. Is it reasonable to ask if Bauckham’s thesis was the product of disinterested historical inquiry? Anyone who has read the first chapter of Jesus and the Eyewitnesses will know that my overall concern in the book was to help Christians recover the confidence that the Jesus they find in the Gospels (rather than in some dubiously reconstructed history behind the Gospels) is the real Jesus. (2015-09-01). I (Still) Believe: Leading Bible Scholars Share Their Stories of Faith and Scholarship (p. 27). Zondervan. Kindle Edition. Does this entitle us to be suspicious that the arguments might have been tendentious? I did not think this prejudiced the purely historical argument that followed because I am accustomed to making sure that my historical arguments stand up as historical arguments. I have covered in depth what his “historical arguments” look like in a detailed series of chapter by chapter posts now available in the archives. One of the more bizarre of Bauckham’s “historical arguments” is to compare the gospel narratives of the crucifixion and resurrection of Jesus with testimony of another “unique” event, the Holocaust of the 1940s. To approach the testimony of survivors/eyewitnesses with a hermeneutic of “radical suspicion” is “epistemological suicide”. Normative approaches of critical analysis of the evidence, of testing the evidence, are set aside in preference for a choice between either believing or rejecting the testimony, for either cynically rejecting the “astonishing testimony” of something unspeakably unique or charitably trusting the words of a privileged eyewitness report. Ad hoc rationalisations dominate: if passages such as the crucifixion narratives are replete with biblical (Old Testament) allusions it is because the eyewitnesses were overawed by their memories of the events; yet if passages such as the resurrection narratives contain no biblical allusions it is because the eyewitnesses were even more overawed by their memories of something that “defied reality”. What about Bauckham’s personal faith interest? Does that shape his work in any way? Maybe (but how could I ever know?) I would still love God if I came to the conclusion that there was no shred of real history in the New Testament. But, to say the least, I would find it more difficult to believe in God if I did not believe that God became incarnate as the man Jesus, who died and rose bodily from death and is alive eternally with God. (Here I differ profoundly from people who find it easier to believe in God than in the incarnation and the resurrection.) This gives my love of God an indispensable stake in the historical credibility of the Gospels. For as long as I have thought about it, it has always been clear to me that, for Christian faith to be true, the Jesus Christians find in the Gospels must be the real Jesus . . .
(2015-09-01). I (Still) Believe: Leading Bible Scholars Share Their Stories of Faith and Scholarship (p. 24). Zondervan. Kindle Edition.